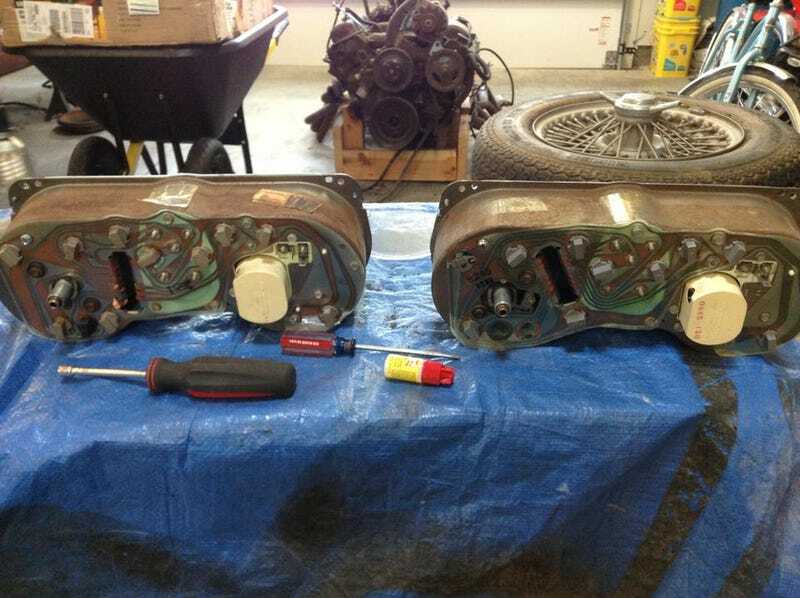 The "new" (1978) gauge cluster is on the left, the current (1981) cluster is on the right. Another pic and info below... I need opinions/help. I want the 100mph speedo and the tach from the older cluster, but it isn't a simple plug and play like I had hoped. The circuit boards are different. So. I think the easiest way to get around my electrical problem would be to take the actual speedo and tack gauges out of the 1978 cluster and install them in the 1981 cluster. The speedo is mechanical so it shouldn't be a problem (hopefully) and the tach is electric... but it doesn't run off of that long plug (the one that fits in that rectangular hole in the board). I don't think I can transfer the oil and water gauge over because the 1978 gauges run off of a different voltage (or amperage or resistance... something is different) than the 1981 gauges. Oh, and the clock on the 1978 gauges is wonkey, I can't get it to adjust the time. So I will probably take the clock from the 1981 cluster if possible. PS: I removed the current gauge cluster from my dash in record time! (yes, I time myself) I have now gone through that procedure more than 5 times.